밴 고흐, V. van Gogh/ 폴 고갱, P. Gauguin. ∧ 밴 고흐: 자화상. 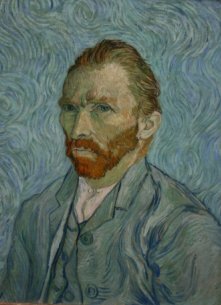 V. van Gogh, Self-Portrait, The Orsay, Paris. ∧ 밴 고흐: 오벨의 교회. 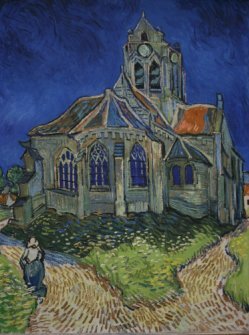 V. van Gogh, The Church in Auvers-sur-Oise, 1890, The Orsay, Paris. * 오벨에 살며 극히 짧은 기간 평정을 유지했지만 곧 환각과 실의의 발작이 번갈아 계속되고 광기가 되었다. 후에 자살을 한다. ∧ 밴 고흐: 탕기 씨의 초상화. 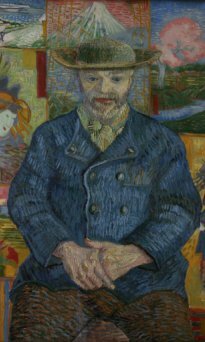 V. van Gogh, Protrait of Pere Tanguy, 1887-1888, Rodin Museum. * Mr. Tanguy (탕기 씨)는 생활고로 고생하던 밴 고흐에게 매우 친절 했다. 밴 고흐는 그에게서 그림물감도 샀고, 때로는 그집 뒷방을 그의 화랑으로 쓰기도 했다. Van Gogh bought his paints from Pere Tanguy, who was very kind to struggling artists. 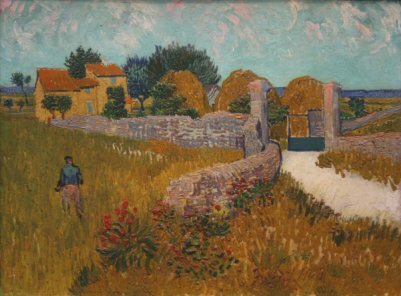 van Gogh often used his back room as a gallery for the artists' latest work. ∧ 밴 고흐: 휴식 (休息). V. van Gogh, The Rest from Work, 1890, The Orsay, Paris. * 밀레가 그린 그림을 본따서 그렸다고도 한다. 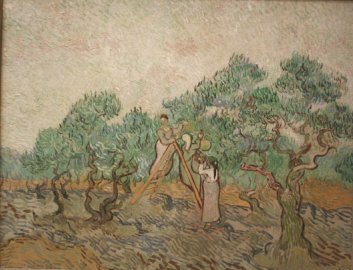 Vincent van Gogh copied some from the paintings of the peasants of J.F. Millet. 빈센트 반 고호, Vincent van Gogh (1853-1890): 네덜란드의 화가. 초기에는 네덜란드의 농부의 생활을 어두운 색갈로 그리고; 말년에 와서는 프랑스에 머물며 대담하고, 밝은 색갈로 그림을 그렸다. 정신병이 걸리고, 자살로 그의 생애를 끝낸다. Dutch painter. 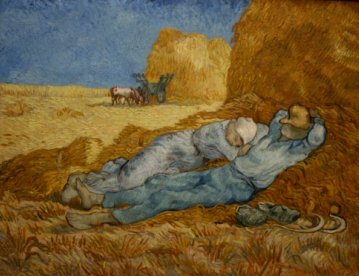 His early work portrayed Dutch peasant life in somber, dark colors; his later work in Provence in France (1888) was painted in bold, brilliant colors. His life was filled with suffering and despair, culminating in insanity and his suicide. 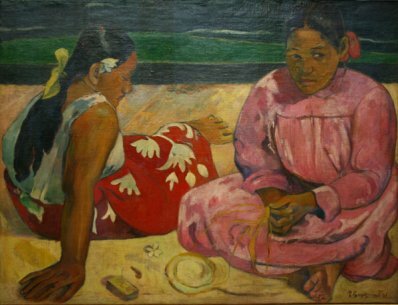 폴 고갱, Paul Gauguin (1848-1903): 프랑스의 화가. 시민 생활에서 도피하여 생활이 보다 원시적인 곳을 찾았다. 1891년에는 타이티 섬에 정착하고, 여기에 사는 사람들을 원시적(? )으로 그린다. He was a leading Post-Impressionist painter. 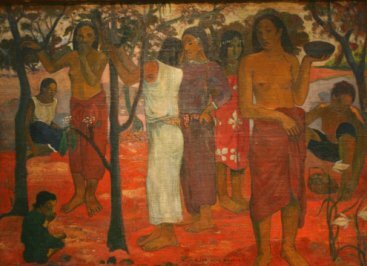 In 1891 he settled in Tahiti and his paintings of the islanders show the influence of primitive art. ∧ 폴 고갱: 타이티의 여인. P. Gauguin, Tahitian Women on the Beach, 1891, The Orsay, Paris. ∧ 폴 고갱. P. Gauguin, Nave Nave Mahana, 19th century, Museum of Fine Arts, Lyon, France. ∧ 폴 고갱: 프랑스 브르타뉴지방의 소녀들이 춤을 춘다. 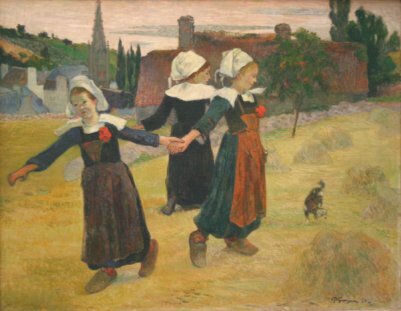 P. Gauguin, Breton Girls Dancing, Pont-Aven, 1888, National Gallery of Art, Wash.DC(프랑스 박물관이 아님, Not from France). * 아직도 프랑스의 브르타뉴 여인들은 위와 같은 전통적인 의상과 머리장식을 한다. 옛날 켈트족의 전통인 것 같다. In Brittany, France, they are dressed in traditional costume and Coiffe, the typical Breton lace head-dress, possibly of Celtic origin. 2008/05/07 오 전 2:53 | 프랑스 박물관. ∧ 트루즈 로트렉: 댄스하는 아브릴. 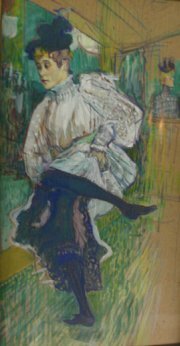 Henri de Toulouse-Lautrec, Jane Avril Dancing. Museum of Fine Arts, Lyon, France. ∧ 트루즈 로트렉. 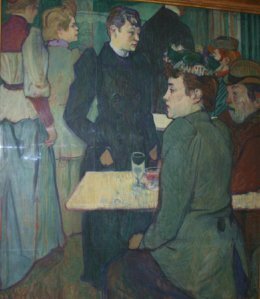 Henri de Toulouse-Lautrec, A Corner of the Moulin de la Galette, 1892, National Gallery of Art, Wash DC (프랑스 박물관이 아님, Not from France). 앙리 트루즈 로트렉, Henri de Toulouse-Lautrec(1864∼1901): 추락사고로 15세에는 불구자가 되고, 1882년에는 파리로 이사 와서 주로 카바레, 매춘 굴, 경마장, 서커스에서 그림을 그렸다. 광대 여자 챠우 카오는 그의 작품의 하나이다. 알코올 중독, 매독에 의해 36세에 사망하였다. He was born in Albi in 1864. 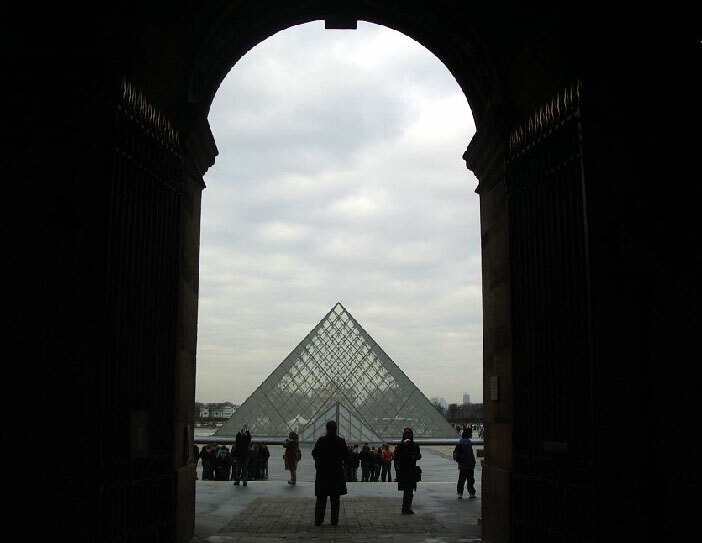 Crippled at 15 as a result of two Falls, he moved to Paris in 1882, recording the life of the city's cabarets, brothels, racecourses and circuses. A dedicated craftsman, his bold, vivid posters did much to establish lithography as a major art form. Alcoholism and syphilis led to his early death at the age of 36. 쇠라, Georges Seurat (1859-1891): 신 인상주의를 창시한 프랑스의 화가. French painter, the founder of pointilism. Developing the impressionist concerns with light and atmosphere, he evolved a distinctive technique for rendering appearances through innumerable dots of pure color, which produced a number of masterpieces. ∧ 쇠라: 서커스. 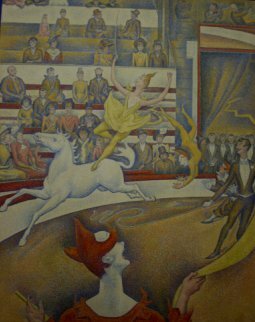 Georges Seurat, The Circus, 1891, Museum of Fine Arts, Lyon, France. 시나크, Paul Signac (1863-1935): 쇠라와 함께 신 인상주의를 창시한 프랑스의 화가. French neoimpressionist painter and theoretician, a disciple of Geroges Seurat. He was an exponent of pointilism. ∧ 시나크:우물에 있는 여인들. 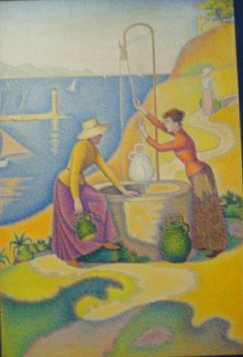 Paul Signac, Women at the Well, The Orsay Museum, Paris. 루소, Henri Rousseau (1844-1910) : 프랑스의 화가. 전직이 세관원이었기에 때로는 그의 애칭인 "leDouanier", 세관원이라고도 불리운다. 원시적(? )인 그림을 그렸다. 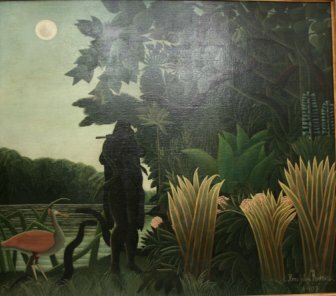 Rousseau, also known 'Le Douanier' meaning customs officer: French primitive painter. A collector of tolls, he retired at 41 to take up painting full time. His early work was mocked for its naive style and apparently inept draughtsmanship However, a few artists, including Picasso, were impressed by his work. ∧ 루소: 뱀을 부리는 사람. Henri Rousseau: The Snake Charmer, 1907, The Orsay Museum, Paris.